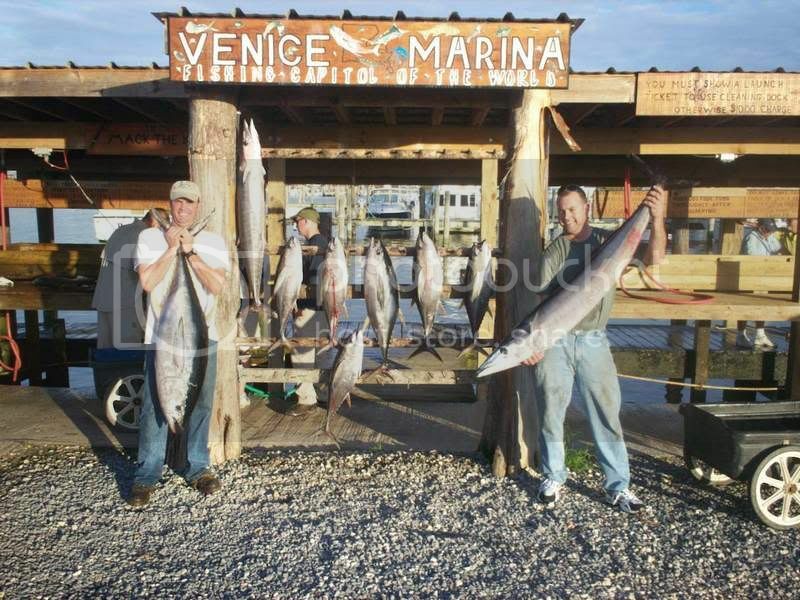 Ran a trip out of Venice on thursday with Rex and Jack from Austin, Tx. They wanted tuna and tuna they got. We started out by struggling big time to catch mullet. In an hour we had about 10-12 mullet. Then the last two casts we got about 20 more mullet. In the end we didnt need any mullet at all. Couldnt even buy a hit on a mullet but as soon as we started chunking with the blackfins we had jigged up we had doubles on yellowfin. In about 2 hours we landed a dozen yellowfin up to about 70 pounds. Of course we released a few with only two anglers on the boat. Most of the fish were in the 20 pound class. The rigging of choice was 80 pound frenzy flouro, with a 7/o circle hook and a chunk of blackfin. The fish were eating chunks very aggressively and none of them had any thing else in their stomachs. Around 1230 a storm started coming through so we moved a little ways to try and catch a wahoo. First two rigs we trolled by produced nothing but on the third rig the first pass was a double header as both guys got their first hooters. the big one ate an Orange halco trembler and weighed in at 62 pounds. We ended up keeping 7 yellowfin and 2 wahoo. On a side note I caught at least three additional yellowfins on jigs while trying to jig up blackfins.